In RuneScape, you have the ability to change the name that everyone will see. This is called your Display Name. All member's accounts can change the name that is seen in-game, on the forums, FunOrb, and on the high scores. 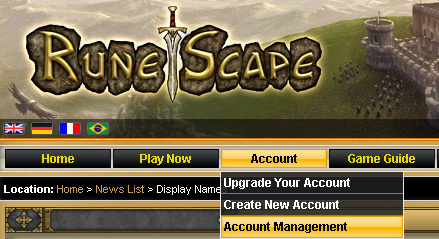 To change your display name, you will need to go to "Account Management" which you will find on the drop-down menu on Runescape's front page. From there, you will be on the main page for managing your account. The option to change your name will be on the second row of options and to the right under the "Account Settings" banner. Your display name can be changed to anything that is NOT your current name or any name that isn't taken. The same restrictions apply when choosing your account username the first time. You may not have more than twelve characters, and cannot have punctuation other than a hyphen or more than one consecutive space. You are however allowed to capitalize and lowercase as you wish. You may only do this once in a 28-day period so be careful! After that 28-day period is up, you will have the option of going back to your normal account name. For seven days after you've not yet changed it back, your former display name will be held. This means that it will be unavailable to other players and you can use it again if you want. If your name does not change right away, don't worry. It may take up to fifteen minutes for your name to be changed on the forums, in game, on FunOrb, and on the high scores. However, your login name will remain the same, no matter how many times you change your display name. If you look on your friends list, you will be able to see your friend's former display name. If they have a changed name, there will be a small green and blue person icon with an arrow. This signifies that they have changed their name. If you hover over that player, you will be able to see their former display name or account name. Remember that you cannot change your display name back for 28 days after the change has taken place. Choose a name that you yourself would like. A name that represents you or anything about you in game or real life. Don't put in personal information about your age, location, or name. Offensive display names are also a bad idea. Regular usernames that are offensive can be reported, and Jagex has the power of removing your offensive display name. Your display name would then be changed to a random sequence of numbers and you will find yourself unable to log into the game until you change your display name to something more appropriate. If you keep it up, Jagex also has the power of removing your changing powers for a year and will assign you a username. Also, on Sal's forum, you have the ability to enter your Runescape name. If you want to enter your new Runescape display name, you will have to do that by yourself. Runescape's display name feature is not linked to Sal's forum's Runescape Username field in your profiles.